It wasn't particularly visible during last year's SEMA show, as it was tucked away in some out-of-the-way booth, but I knew I had to track it down as soon as I heard about Bisimoto's Boxster. The trek to see it was well worth the walk, as it is easily the wildest Boxster I've ever laid eyes on. 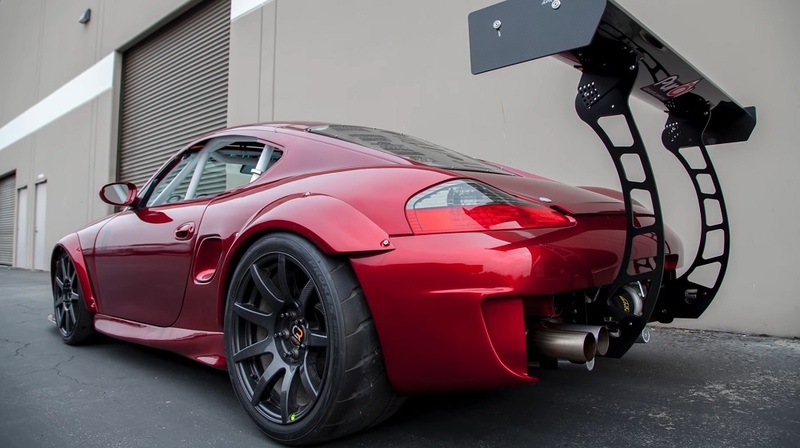 With a huge wing slung out where a 996's engine would be, giant carbon-composite wheels, a center-mounted seat, and big visible turbochargers stuck under the rear bumper, this car is a full on assault on the eyeballs. That might not be the worst thing. Great track cars are rarely pretty. Matt Farah recently got an opportunity to take this mad machine out for a few track laps, and he loved it. This Boxster was originally equipped with a 217-horsepower 2.7-liter that had blown itself up by the time Bisi bought it. After a full bevy of upgrades, that same 2.7-liter is now capable of more than 500 horsepower with an on-demand overboost function on E85 corn fuel. With a stripped down interior and a whole lot of carbon fiber, Bisimoto has got this car down to under 2500 pounds, too! Toss a sticky set of tires at it, and it's bound to perform wonderfully on track. The video below seems to prove that to be the case. This car has everything you'd want in a track car, including the added thrill of the wooshing and blow-off sounds from that forced induction. Aside from a pair of moments where Matt misjudged his braking and cornering entry speeds, though not due to the unfamiliarity of a center-mounted seat, as one might expect. No, instead Farah claims the car's huge 8-piston calipers are un-assisted manually actuated, and that his braking foot just got to the point it couldn't hammer that pedal down anymore. The car is as fast as poop through a goose. It grips like it's riding on sandpaper wheels. And for a car that entered the Bisimoto shops as an unloved base Boxster barely worth a few grand, it's been reborn as a phoenix from the ashes, ready to take on GT3s and GT-Rs. Bisi says he's going to upgrade the 2.7-liter to a better-built 3.4-liter for even more power. Here is hoping he sorts out the braking system, too!